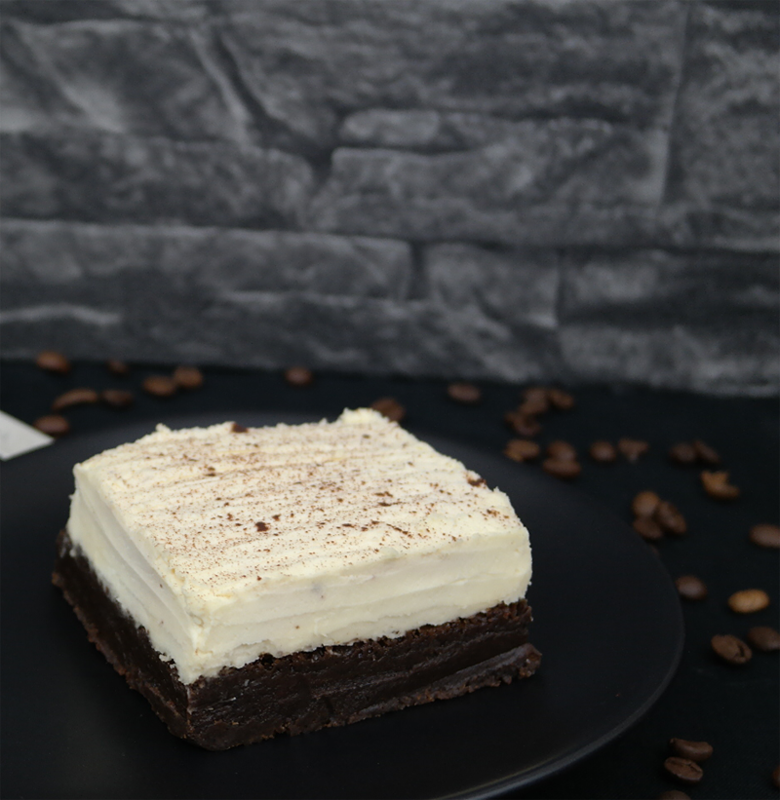 Lavazza Coffee Latte Style Dessert Brownies - Sugar, Darling? One of the many loves that my husband and I share is our great love of coffee. Whenever we go away we make special stops at independent cafes that we've heard great things about and most of our kitchen worktops are dedicated to coffee making devices like a filter machine, a bean grinder and our collection of espresso pots and aeropresses. Yep, it's pretty safe to say that we well versed in the ways of the coffee bean and know a great blend when we see (smell, taste!) it. Lavazza has always been a brand that we have loved - our cupboards usually contain a kilo bag of their beans and we love trying out any special new blends that we spot while out shopping. I suppose the best endorsement we have other than that we think it is delicious is that our Italian friends both drink it at home and serve it in their deli and as is well known, Italy is indeed the coffee lover's capital! You can imagine then how excited I was when Lavazza got in touch to ask me to take part in their 120th anniversary celebrations by creating some recipes using the limited edition anniversary coffee blend! I nearly popped with anticipation waiting for our parcel of treats to arrive and wonderfully it came just in time for Christmas. I had started planning recipes straight away in my head, doodling notes all over the place but as is usually the case the first idea I came up with was the one I loved the most. The anniversary blend is made of 100% Brazilian Arabica coffee; rich and decadent with delicious chocolate and caramel tones. It was clear to me that it would be perfect is a brownie, but I knew to suit this predigious occasion it needed to be something a little more special that allowed the coffee to take centre stage. I began thinking about the kinds of coffee drinks that I enjoy most and then it hit me - why not imitate a latte in dessert form with a bold base of coffee and a dreamy creamy topping!? Using just a layer of whipped would have been easy, sure, but it wasn't hitting the spot on this occasion. I needed something with more oomph that would be fluffy and light but hold its form while still being as creamy as can be, just like in... a tiramisu! 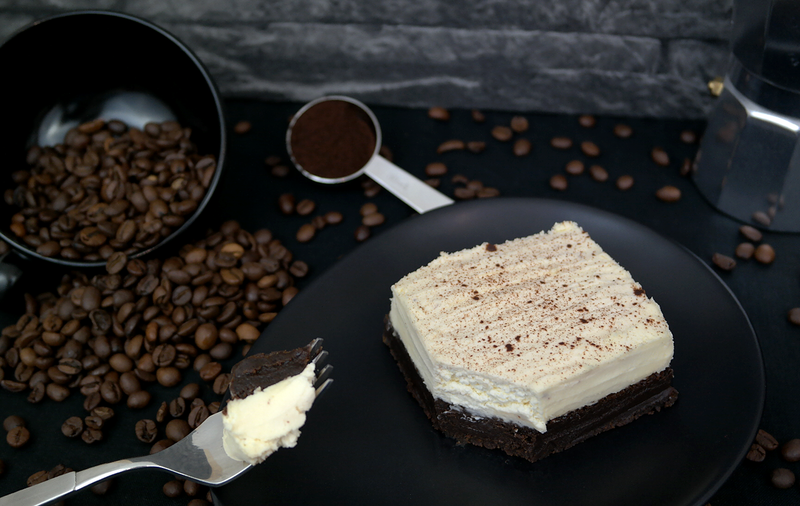 It all came together then, the rich brownie base topped with a cloud of whipped mascarpone and cream, a perfect tribute to the latte and a very fitting celebration of the luxuriousness of fresh coffee and two classic Italian icons - Lavazza and tiramisu! In order to make the flavour of the coffee sing through all the richness and creaminess I have put the actual coffee grounds into the brownie mix rather than just using brewed liquid coffee. I promise this does not give a gritty texture and the cooking does not turn it bitter. An espresso grind is much finer than the one that you would use in a standard filter machine and so it just melts in with the brownie mix giving an impressive punch of coffee flavour, far more than you would get from just adding a shot of espresso. So here it is, one of my favourite and most decadent recipes to date and one that I would just love for you to try yourself! Turn your oven on to 170 C/350 F to preheat. Melt together the ground coffee, milk and dark chocolate chunks and butter in a saucepan over a medium heat making sure not to let it catch on the bottom or start to simmer. Cook just until it is melted together, then take it off the heat and add the three sugars, mix well and then leave to cool to room temperature. You may want to use this time to prep your baking tin. When the melted mixture is at room temperature carefully beat in the first three eggs until well combined, then add the remaining two with the vanilla extract and mix until well combined. Whisk together the flour, cocoa and salt in a seperate bowl and then add it to the chocolate/sugar/egg mixture and carefully fold it in until just combined - don't over mix it or you'll get either a rubbery or a too cakey brownie, it's no harm if there are a few bits of flour still visible. Pour the mix into your prepared tin and bake in the preheated oven for 15 minutes before rotating the tin and cooking for a further 10 minutes or until the brownies are set but the centre is still very squidgy - when you put a toothpick into the centre it should come out with sticky crumbs on it but not liquid batter. When cooked leave the brownies to cool completely in their tin. When your brownies are cool you can make the topping. Whip the double cream until it is at soft peak stage. Put the mascarpone cheese into a seperate bowl and mix it with the milk and vanilla extract until it is the same consistency as the whipped cream, then mix in the icing sugar (if you are using it). Fold the mascarpone mixture into the whipped cream and then add a generous layer to the top of your brownies - this can either be done by spreading over the whole tray and chilling for an hour or so before cutting them into portions or piping or spreading it on to the pre-cut brownie portions. Give them a final light dusting of cocoa powder just before serving and enjoy! *This recipe contains ingredients that were gifted for review. All content was created and written by me and all thoughts/opinions are honest and my own. For more information head to my disclaimer page.